Nudging the line between the Walkman music mobile range and the Cyber-shot cameraphone line-up, Sony Ericsson's 5-megapixel camera-packing W902 sports the best-specified shooter seen so far on a Walkman-branded handset. Previously, while the Walkman phone range has hit the right notes for music buyers, anyone after a top-of-the-line cameraphone performance would have to look to Sony Ericsson's Cyber-shot line-up. Cyber-shots had all the best imaging gadgetry, Walkmans the best music. It may have worked a treat for marketing people keeping the ranges separate, but not for anyone who wanted a Walkman music phone with a Cyber-shot grade camera performance. The W902 is an attempt to bring higher quality imaging to a Walkman phone. Its camera doesn't have everything you can get on equivalent Cyber-shots such as the 5-megapixel C902, let alone the 8-megapixel C905 flagship model, but it certainly packs more imaging punch than we've learnt to expect from a Walkman cameraphone. Of course, music is still top of the charts for any Walkman device. The W902 comes with 8GB of Memory Stick Micro (M2) card storage in the box, plus high quality earbud earphones. It packs in the latest Walkman phone software, including Sony Ericsson's Shake Control gadgetry, with nifty side-mounted dedicated Walkman buttons for easy click control. Besides the higher quality camera, the W902 doesn't push the boat out totally on higher-tier feature; there's no GPS satellite receiver built in or Wi-Fi connectivity, and it doesn't use a smartphone operating system or have touchscreen control. In fact, it has a familiar set of features as we've seen on many recent Walkman and other Sony Ericsson mid-tier handsets. High-speed data connectivity comes courtesy of its HSDPA 3G mobile data, offering download speeds of up to 3.6Mbps. It carries a decent mix of multimedia features, including good quality video playback, support for 3G streaming and fast downloading, video calling (using a secondary front facing camera), and has some tidy web-based applications such as Google Maps and YouTube, plus a full web browser. An FM radio also adds to the music entertainment factor. Like the C902, to which it has a family resemblance, the W902 is a slim candybar model with an elegant, refined look. Available in smart looking black, green or red, it's a fraction under 12mm thin (vital stats are 110(h) x 49(w) x 11.7(d) mm), while its combined metal, plastic and glass covered display weighs in at 99.8g. The materials and well-balanced design make it feel reassuringly solid and tactile in the hand but also very pocketable. Understated but attractively built, the W902 has a fine set of controls too. The excellent numberpad keys are stylishly small and thin, but are still decently spaced, easily manageable and responsive. While the control keys above these are arranged a bit closer together, they're still well defined for reliably accurate pressing. As usual, a central navigation D-pad is the hub of the control set up, flanked by softkeys, regular Call and End buttons, plus a clear key and a hotkey for Activity Menu options – a set of useful features and apps arranged in easy to access menus. It's all familiar Sony Ericsson mid-range stuff, as is the user-friendly menu set-up, with an initial grid of menu option icons followed by tabbed sub menus. The W902 has a 2.2-inch, 262,144-colour, QVGA (320x240 pixels) display that's typical for one of Sony Ericsson's mid-rangers but not particularly large for a hot-shot cameraphone. It doesn't have the touch-sensitive camera shortcut buttons surrounding it that the smaller screened C902 and other higher range Cyber-shot models employ, but it does have a scratch resistant mineral glass panel over the screen. There is too a motion sensing accelerometer built in which automatically flips the display between portrait and landscape modes in certain functions. There's no Cyber-shot-style lens cap covering or slider protecting the camera on the back, though the lens is slightly recessed. There's an LED flash above it for low-light shooting – not that common for Walkman handsets. Sony Ericsson has slotted in a set of dedicated Walkman player controls into the side of the phone (forward, rewind, play/pause). These sit discreetly between the contrast-coloured camera button and volume/zoom rocker. Although the normal D-pad doubles as music player controls when it's onscreen, the dedicated keys can usefully work the tune player when the Walkman software is running in the background. On the top of the handset is a Walkman hotkey, which when pressed from standby takes you straight into the music player. While tunes are playing, it also activates the Shake Control. This enables you to switch tracks, adjust volume or shuffle playback by holding the Walkman button and moving the phone in a particular direction. We've always thought it gimmicky rather than particularly practical way to swap tracks (what's so difficult about buttons? ), on this phone it's positively awkward to operate, requiring an odd grip on the phone to press the Walkman button and shake without accidentally pressing the side buttons (which you could just press anyway) or sending the phone flying. Sony Ericsson still hasn't made standard 3.5mm headphone sockets the earphone connector of choice for its music phones. It sticks with the chunky regulation Sony Ericsson USB/charger/earphone multi-connector, which again fits into the side rather than the bottom or top, which would make it more streamlined in the pocket. Thankfully, as usual with Walkman phones, there is a 3.5mm adapter socket included as part and parcel of the 2-piece headset. It's a particularly good set of earphones for a mobile phone package, and delivers a really impressive audio performance. It has plenty of depth and tonal range, with lots of wholesome bass in there too. The Walkman player software is as slick as we've come to expect – user friendly, easy to navigate and attractive to the eye. A large spread of track listing categories includes albums, artists, tracks, playlists, genres, years, audio books, podcasts, and Sony Ericsson's SensMe option. The latter option can generate automatic mood and tempo based playlists by using info you've added to tracks in Sony Ericsson's Media Manager PC software before copying tunes over to the phone. As well as the usual USB and Bluetooth transfer methods, a card reader is included in-box to make copying tunes onto cards easier. With the 8GB M2 card included in-box, there's a hefty amount of storage room for music tracks (MP3, MP4, M4A, AAC+, WMA and WAV formats are supported). This is welcome, particularly as the phone's own internal storage is a mere 25MB. As well as the decent earphones, the loudspeaker on this phone isn't as grating as on most mobiles, and can be cranked up pretty loud. Bluetooth earphones are also supported. Regular music phone apps, including an effective FM radio and Sony Ericsson's excellent TrackID song identification software, are included too. While the Walkman player functionality is right up there with Sony Ericsson's best, the W902's imaging is a definite step-up from previous models. The 5-megapixel camera has a broadly similar set of features to the C902 (minus touch shortcut controls on the screen and face recognition shooting). Sony Ericsson's clever BestPic technology crosses over from the Cyber-shot range, enabling users to end up with better shots by the image sensor recording a sequence of nine shots before, during, and after you press the shutter button. From these you can select the ideal one – which is handy if you're taking pics of non-static subjects. An efficient 2-step autofocus system is included, enabling users to capture sharply focused images, including fine quality macro close up shots. Image quality generally is high, with plenty of detail and mostly good colour rendition. It's certainly an improvement on previous Walkman phones shooters, offering much better functionality and picture quality. It doesn't quite match top-notch 5-megapixel Cyber-shot performances though, as we had occasional slight imperfections in colour rendering. Exposure and contrast was usually good, though indoors shooting was less crisp than outside, even with the flash. That works reasonably over short distances, but doesn't match the sort of xenon flashes we've seen on some top grade cameraphones. There's a good selection of image adjustment options available, plus image editing tools, images can be uploaded straight to Blogger accounts from the handset. Video clips have also been made easily bloggable. Video shooting on this model isn't particularly special. It can shoot at up to QVGA resolution at 30 frames per second, offering smooth playback of average quality footage. In addition, Sony Ericsson has pre-loaded a YouTube app on this model which allows users to upload their own clips quickly and easily, as well view video clips from the online site. Google Maps software is included. Despite no onboard GPS, it offers a way of finding your rough location on an onscreen map using cellsite-based triangulation. You can also search for places and services nearby and get routing info. This app, which is appearing in many mid-tier Sony Ericssons, is an extremely useful piece of software to have onboard, even if it's not full satellite navigation. The W902 has a full web browser, which works efficiently enough for a mid-tier phone, and is speedy to download pages, thanks to HSDPA speed data. It's similar to those on other mid-range Walkman phones, providing a range of pan and zoom options, plus an option for page formatting in mobile optimised Smart Fit mode. The home screen is pretty user friendly, even if text is quite small. RSS feeds are also supported on this device. Among the other functions included are a web-based AccuWeather.com weather forecasting app, plus a motion sensor-enabled Walk Mate stride counter - a keep fit app that records how many steps you ad your phone have taken each date. A full complement of organiser tools are included too - calendar, calculator, world clock, sound recorder, notes, tasks, alarms, stopwatch, timer, and code memo app. There's also a music quiz game using onboard tunes and three other decent games. Call quality on this handset is top class. It's exactly what you'd hope for on any phone – loud, clear and reliable. Battery life isn't bad either; Sony Ericsson reckons on 360 hours standby or 4 hours of talktime in 3G coverage, or 380 hours standby or 9 hours talktime on GSM networks. Alternatively, the music player alone can run for up to 25 hours. In real life usage, we managed to get around three days of normal phone use between charges. 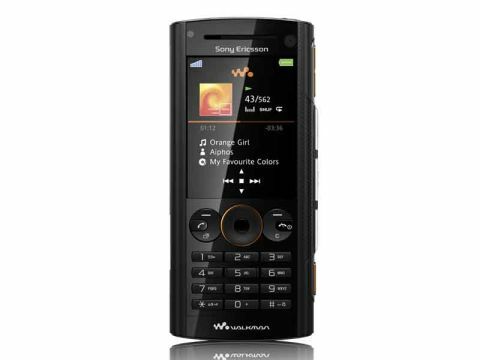 With its classy design, a top-drawer Walkman player with 8GB of in-box storage, and a decent quality 5-megapixel camera, the Sony Ericsson W902 provides an attractive option for the music phone buyer who also wants presentable snaps. It's not a do-everything handset, lacking high-end features such as GPS, Wi-Fi and smartphone functionality, and apart from the camera, the W902's specs aren't much different to other mid-tier 3G Sony Ericsson Walkman phones. The real selling point of course, is the higher quality shooter that sets off this appealing Walkman handset – and that's just what many people have been asking for.